The title was the first tip-off—being that it’s in French, known as the language of love, and translating to “the flower,” which of course is symbolic of love. I would go so far as to say that the episode’s teasing glimpse of what may be the mysterious four-toed statue was another hint. Maybe it’s just me, but the statue, which has been said to be depicting everyone from Richard Alpert and Daniel Faraday, to John Locke and baby Aaron, seems to be female. With its long hair, sloped shoulders, slender waist, thin legs and what looks like a miniskirt, it’s either a chick, or a very effeminate guy. I guess that doesn’t rule out the meek Faraday or guyliner-loving Alpert. I could totally see Alpert with full Egyptian makeup and sun god garb. But I think it would be more interesting if the statue was of a woman, a goddess to be respected and worshipped that is perhaps an effigy of the island itself—an effeminate energy that will be controlled and abused by men who will fight to rule over her. There are a lot of parallels here between this concept and how our patriarchal religions demonized, converted, and annihilated goddess/earth-loving peoples, but I’ll leave that until we know what gender the statue is for sure. For now though, let’s get back to love. I guess it’s a bit unexpected that an episode about love would focus on Sawyer. But, maybe this explains why Sawyer has always been so angry. Perhaps he was just a true romantic at heart who has never been able to express this side of himself due to his hang-ups about his past. With this now behind him, he is able to transform from Sawyer, a troublemaking conman, into a new superhero identity—LaFleur, a clean-shaven, caring guy who picks flowers to bring home to his lover. In fact, this may be a bit of an over-correction. The real James Ford is probably somewhere in between the rough and rugged Sawyer and romantic LaFleur. But interestingly, both of these archetypes are that of the romantic. One just represents the unattainable bad-boy that many women want, while the other is the all around nice guy that they probably need but usually reject—unless they also happen to have the rough and rugged looks. So with LaFleur, Juliet really gets the best of both worlds—the unattainable man she wants, but, domesticated. Too bad such perfect situations rarely last. 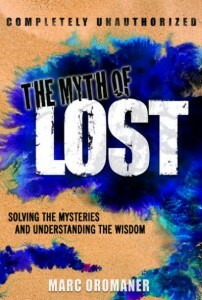 And since Lost has been so good at making metaphors for the real world, it probably won’t last too long here either. Another love theme to play out in this episode is the idea of how time fits into the picture. After Horace Goodspeed finds an ankh necklace that belonged to his wife’s now-deceased husband, Horace wonders if three years is enough time to forget about someone and love somebody new. The answer represented symbolically by the ankh is no and yes. An ankh is an Egyptian symbol with a hoop atop a cross that represents everlasting life. 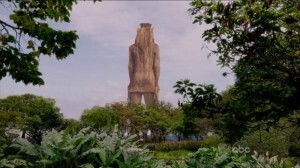 (Egyptian gods are often depicted carrying it by its hoop, as the giant statue seen in this episode appears to be doing.) 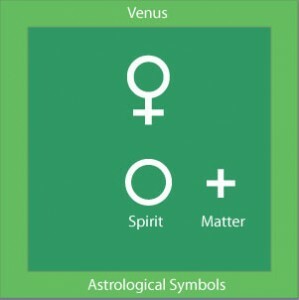 Interestingly, the symbol is similar to the astrological symbol for Venus, the goddess of love. Surely, this is no coincidence. Love never dies. It is eternal. Once we love someone, a part of us always will. But that doesn’t mean that we can’t love again should something interfere with the physical expression of that love. Sawyer insinuates this when he tells Goodspeed that he once fell for someone but in time, her learned to forget about her. And this leads us to the major message about love in the episode. 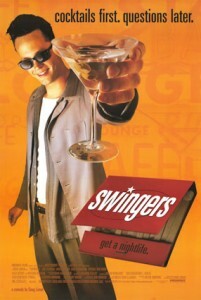 In the movie Swingers, Jon Favreau’s character Mike is deeply heartbroken over his girlfriend who has just broken up with him. In fact, he’s so torn up about it, he spends half the movie moping around, wondering if she’ll call him to get back together. She doesn’t. Eventually he comes to meet Heather Graham’s character, Lorraine. At first, he feels that she is no replacement for his ex, but decides to go out with her just to get his lost love off his mind. Eventually, he comes to grow real feelings for Lorraine and totally forgets about his ex. And sure enough, that’s exactly when she calls. It’s not just Lost that metaphorically represents real-world truths on the screen—all good stories do it. It’s that Lost covers so many that make it unique. Lost’s take on this same theme happens shortly after James “Jim LaFleur” Ford says “I love you,” of all things,” to his star-crossed lover Juliet. Those three words echoed through time and space and brought his ex-love Kate right back into his life. In this case, it happened quite literally. The flash could’ve sent Kate to any time, but no, it brought her right to that one despite the fact that there hadn’t been any flashes on the island in three years. The message is that whenever we have strong feelings for someone who doesn’t feel the same way about us, our energy sort of intrudes upon theirs—making them feel even more repulsed. Yet, as soon as we back away or forget about them, we leave a space that allows them to reenter our lives. It’s like they say, “you always find something when you’re not looking for it.” Or, when it comes to desire, “we always want what we can’t have.” Translate that to love and you get a scenario that seems to be an almost cruel truth about how it seems to work—that we unintentionally push away that which we want and inadvertently invite in that which we don’t. Why? It’s that Law of Attraction thing again. Whether you believe in it or not, there is a definite truth to how The Law of Attraction works. When we are focusing on how we need someone or something, we are actually focusing on how we don’t already have it. So, not having it is exactly what we continue to get. But as soon as we focus on how we do have something, in Mike’s and LaFleur’s case, a feeling of love, then we invite every possible path for that love to come to us—including ex-lovers. Ain’t life a stinka? Well, not once you become aware of this pattern and learn to master it. If this is how it works, the trick then it would seem, is to pretend to want what you don’t want and to ignore that which you do. This isn’t exactly new information, it’s why there’s a game of love to begin with and why those who play it and act aloof towards potential partners tend to attract them. Most of us are at least subconsciously aware of how this works. It’s just that it seems more interesting when we see how it all may work like a mathematical formula. For whatever reason, nature abhors a vacuum. So as soon as there is any kind of space, it will provide for something to fill it. This is why we’re always busy, constantly having new challenges to deal with, continually having to buy bigger hard drives to store our stuff, and always having new people enter our lives as soon as others exit. When it comes to love, as soon as we forget about an ex-lover—usually because we’re now with someone new—they return. And the more we try to push them away, the more forcefully they push right back. If this universal truth isn’t cruel enough, our patriarchally-endorsed society’s rules that we must be bound to only one love for most of our adult lives seems like the cruelest rule of all. Good thing we have Lost where we can live vicariously through all the various love triangles, quadrangles, and—if Goodwin, his wife Harper, and Ben show up—love heptagons of the latest depiction of Fantasy Island. An island that can apparently only exist on TV, and in the seventies.